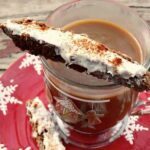 Spicy gingerbread biscotti are perfect with coffee for an afternoon treat. Chipotle kicks up the heat and adds a nice, complimentary smokiness. Mix the flour, oats, brown sugar, baking powder, baking soda, salt and spices until they are well blended. Beat the eggs, coffee,molasses and vanilla in large bowl until well blended. Gradually add the flour mixture, beating just until blended. Let stand at room temperature for 20 minutes for flavors to blend. You can skip this step if you are in a hurry. Divide dough in half on lightly floured work surface. Shape each half into a log, about 12 inches long and 2 inches wide. Transfer logs to greased baking sheet. Bake 30 minutes or until golden brown and firm to touch. Cool logs on wire rack 10 minutes. Transfer logs to cutting board. Using a sharp serrated knife, cut logs diagonally into 1/2-inch thick slices. Place slices, cut sides down, in single layer on baking sheets. Bake 12 to 15 minutes or until crisp and golden, turning biscotti over halfway through cook time. Remove biscotti to wire racks. Spread on one side of the cooled biscotti. Carefully dust with a little chipotle powder. It is easiest if you put some in your hand and take a pinch and let it fall on top of the biscotti. Don't use too much!